The Italian Championship of Lies was born in 1966. The reasons that led to the creation of this competition are to be found in the traditions of our little village over the Pistoia’s mountains, on the Italian Apennines, when in last century people used to meet in front of a fireplace to tell stories that mixed reality and fictious. The Italian Lie Academy, in occasion of the 39th Italian Lies championship, declares the graphics section contest dedicated to Lie. "The weather and the climate change". The competition is structured in a single section. Participation is free. Deadline for cartoon submission is Sunday, July 12th - 2018. Each participant can send up to 4 cartoons. The entry form below must be completed in all its parts and sent along with the presentation of the works that take part in the competition. The comics can be written in your own language, but we advice that you can make a cartoon simply draw, without any text. All the winning cartoons will be published on the website of the Italian championship of Lies (www.labugia.it). The authors waive any fee related to copyright. Prizes will be delivered during of the 39th Italian Championship of Lies thake place in to Le Piastre on 4st and 5th August 2018. The Bugiardino is the symbol of the Championship and is the bell tower of the village with a long nose, like the Pinocchio’s one. It will be awarded with the "International Bugiardino" the best cartoon coming from abroad or drawed by a foreign national. The works will be judged by a jury headed by the italian cartoonist Marco Fusi. Download entry form (click here). 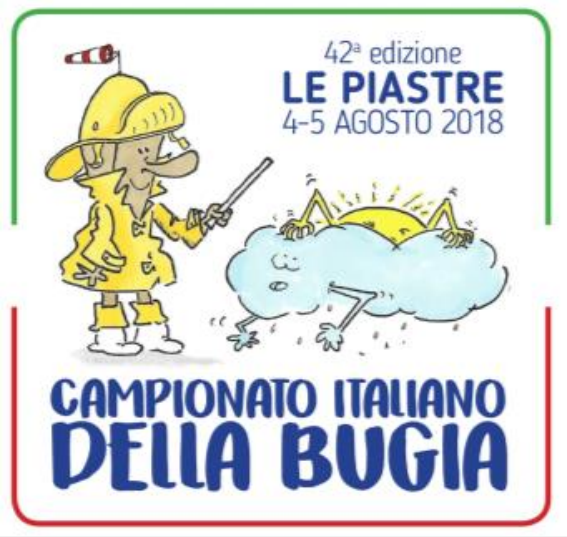 0 Response to "The 42nd Della Bugia Cartoon Contest 2018, Italy"